Since I’ve been on the topic of burgers lately, I thought it wouldn't be right to end this discussion with beef, particularly on this fishy blog. With salmon and tuna burgers becoming a permanent fixture on the Whole Foods fish counters and making regular appearances on the pages of Gourmet and Bon Appetit, you’d think this trendy phenomenon got all the PR it can get. But that’s not the burgers I want to write about. To tell you the truth I never understood their appeal. Salmon has the potential for a making a great burger since it’s delicate and fatty, but using tuna for a burger is like using beef tenderloin. If that's what you do with your beef tenderloin, you should have a chat with your butcher. Burgers are not about refinement; they are about grease and flavor, and no other fish embodies these concepts better than bluefish. I really don’t know how this lovely fish came to have such a bad rep. It’s wild. It’s chuck full of Omega-3 fatty acids. It doesn’t dry out even if overcooked. And it’s cheap. What more could you possibly ask for!? And did I mention that it makes for the ultimate fish leftovers? The trick with bluefish burgers (actually, any fish burgers) is pan frying, not grilling -- unless you enjoy bringing fish sacrifices to the grilling gods. All but burgers made of the densest fish (like tuna) will fall right through the grilling rack. Dredging your fish burgers in bread crumbs and frying them is what gives them a bold and crispy outside and makes them such a decadent treat, rather than a pale substitute for a beef burger. The following recipe askes for bluefish leftovers. Any leftovers will do, but may I suggest that you try bluefish with crispy potatoes? It’s the recipe that converted every single one of my students who thought they hated bluefish. Hmm, am I becoming a bluefish evangelist? Fish substitutions: you can use leftovers of salmon, red snapper, striped bass, branzino, and pretty much any fish that's not too dense (not tuna, swordfish, or marlin). Heat oil in a skillet over moderately low heat. Add the onions and a generous pinch of salt. Cook stirring occasionally until onions are soft and golden brown, 10-12 minutes. Cool for 20 minutes. Remove skin from bluefish and break it up into flakes. Mix it with sautéed onions, mayo, mustard, ginger, herbs, garlic, and freshly ground black pepper. Taste and add salt if needed. Form the mixture into 2 burgers, 3/4 inch thick. Place the burgers on a plate (you can stack them between pieces of parchment paper. Refrigerate covered with plastic wrap at least for 1 hour or up to 2 days. Pour the bread crumbs into a plate. Set a large non-stick skillet over medium heat. When the pan is hot add the oil. 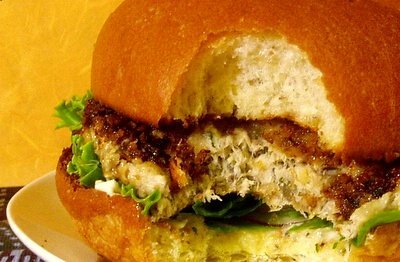 Dredge both sides of blue fish burgers in crumbs and add them to the pan. Be gentle when handling burgers as they’ll be quite soft. Cook the burgers until they brown on one side, about 4 minutes. Flip using a spatula, and cook until they brown on the other side, another 4 minutes. Serve on toasted burger buns with lettuce, tomatoes, red onions, and aioli. Which of these varieties do you think work work better for the bluefish burgers? I think the GF rice krispie type, but I wanted your expert opinion. I agree about rice krispie crumbs. Those should work beautifully. You also don't really need the bun (of course you can substitute gluten free bun, but there is no need). You can shape bluefish into smaller patties and serve them with a salad or as an appetizer. Wanted to show your our take on your Bluefish Burger - we were inspired by your entry and gave it a shot... with delicious results! Thanks! If you can get tuna steaks cheaply enough (the going rate here in North Dallas has been about $9.99 USD/lb), then tuna isn't complete sacrilege for "fish burgers". My recipe, such as it is, may be found here. I will try your bluefish version though. My cousin does not eat any red meat or pork, so I'm always on the lookout for something other than "just" turkey or chicken. BTW, I posted a new salmon recipe here that you may like. I recently found your blog and have added it to my regular reading rotation. Keep up the good work!